Really Simple Syndication (RSS) allows you to check for updates to wiki pages without viewing the wiki. This lets you use RSS readers to receive RSS feed updates and notify you of changes. If you use Mail in Mac OS X v10.6 or later, you can receive mail and RSS feeds using the same reader. Because they both use the same reader, you won't need to change your daily workflow to use RSS. When you're online, your RSS reader checks your subscribed RSS feeds at timed intervals. Whenever a new page is created or an existing page in the feed is updated, the RSS feed is updated and the RSS reader notifies you that the feed changed and which pages within that feed changed. The following shows how an RSS reader compares its current pages against the server, and then updates its own pages based on the status of the pages on the server. Traditionally, when someone updates a document, they attach that document to an email or upload it to a website and notify everyone that the document has been updated. 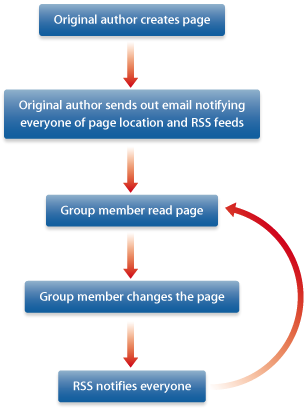 RSS simplifies and streamlines this process by notifying people when content changes.